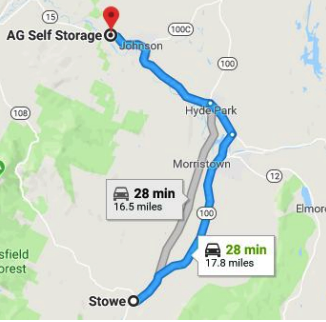 Ready to solve your storage problems near the Stowe, VT area? Come rent your storage unit quickly and easily at AG Self Storage. Our facility is located only 28 minutes away from Stowe, at 1015 VT-15 in Johnson, VT (05656) on the southern border of the Long Trail State Forest. We’re just outside Johnson and near Stowe. Come see why renting a storage unit with us it Safe, Secure, and Simple.